An unequalled experience awaits hikers who embark on the WhaleTrail. The trail traverses one of the Western Cape’s most unique and diverse nature reserves, while providing nature lovers and those who love the outdoors with unique comfortable overnight accommodation situated at spectacular locations. The route stretches over 55 km from Potberg to Koppie Alleen and includes five overnight stops. 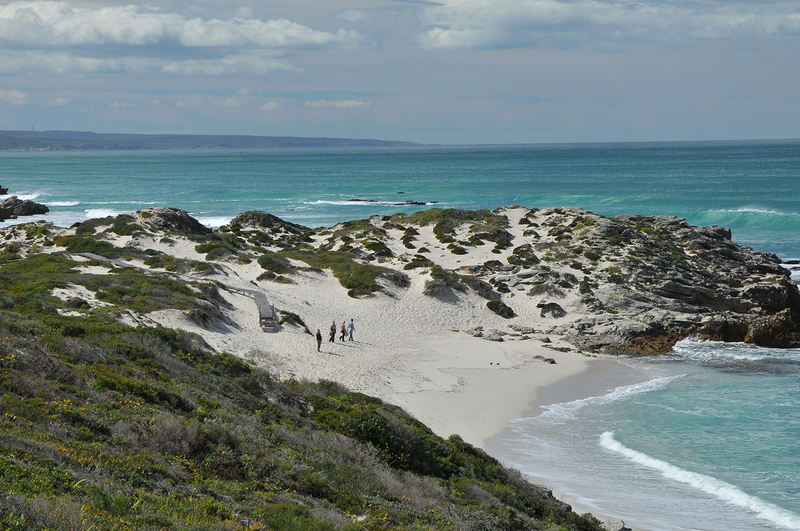 The trail offers the opportunity to explore the unsurpassed natural diversity of the De Hoop Nature Reserve, where the fragrance of fynbos on the Potberg mountains and the unique limestone fynbos plains intermingle with the salty sea air of the marine protected area. Along the way, hikers can marvel at the abundance of indigenous plants while looking for members of the last remaining vulture colony in the Western Cape, numerous other bird species and small antelope. And, yes, of course the whales! De Hoop is world-renowned as one of the best whale-watching spots. Between June and December, this coastline is transformed into one of the world’s most important nursery areas for southern right whales. The trail is designed to attract nature lovers with a moderate degree of fitness.Unfortunately, no children below the age of 8 are allowed on the trail. The hiking is over five days and varies in intensity. Day one is the most strenuous and covers 15 km up the 611m high fynbos-clad Potberg Mountain. In comparison, the third day is only 7,8km long and allows leisure time to explore the marine life in the numerous rock pools along the coast. Reservations are limited to group bookings of either 6 or 12. 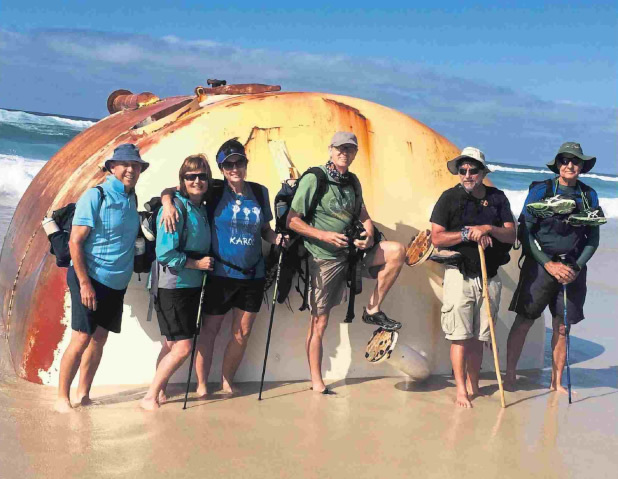 The tariff for the five day hike includes the shuttle service from Koppie Alleen, where the trail ends back to Potberg tourism office and then to the undercover WhaleTrail parking area. Roughing it wasn’t part of the package when the overnight accommodation was planned. The cottages – ranging from Arniston-style houses to A-framed thatched “kapstyl” cottages – are located at the foot of the Potberg mountains, nestled along the coastline and perched high on a sea cliff.All WhaleTrail cottages accommodate up to 12 people, it is mostly 3 bedrooms with 4 beds in each (Hikers bring their own bedding).The five cottages all have a kitchen well equipped with gas stoves, pots, pans, cutlery and crockery enough for twelve. Braai tongs,dishwashing liquid, toilet paper , matches, candles and 45 pieces of firewood is available at each cottage.All the huts have an indoor and outdoor braai facility with open grids, except for Noetsie, where there is only an outdoor braai.The cottages have reliable solar powered lights and gas geysers supply hot water for the showers and kitchen sinks. Every day the transport contractor is on standby to transport the luggage that you do not want to carry yourself to the next cottage, allowing you the luxury of carrying only a daypack, camera and field guides while walking. 60 Litre Standard containers are provided. You will find these units awaiting you in Potberg cottage on your arrival, so you can start to transfer your stuff immediately to the units.A unit can also be a cooler box which you bring with. Up to 14 units per group of 12 will be allowed. You pay for each unit transported for you and this includes the cooler box/es you bring with.In cases where are 2 groups of 6, each group can use up to seven units. This is the toughest stretch of the trail and an early start is recommended. It will take you to the top of Potberg at 611 metres with breathtaking panoramic views of Swellendam in the north, unequalled views of the Indian Ocean and the Breede River, Cape Infante in the east and Cape Agulhas in the west. You will also have a good chance of sighting the rare Cape vulture. The trail descends towards Cupidoskraal where a swim in the dam offers a refreshing end to the day. The trail follows the crest of the Potberg through mountain fynbos with unequalled views of the Indian Ocean and the Breede River. The route finally leaves the Potberg and leads onto limestone hills with strikingly different fynbos, then descends to the enchanting bay of Noetsie at the coast. This short distance allows a leisurely start to the day and ample time for exploring the coastline. Stilgat, with its clear tidal pools and abundant marine life will provide an unsurpassed opportunity for snorkeling and swimming. Several whale watching points lie ahead until you reach a lovely sandy beach stretching all the way to Hamerkop. It is well worth the long walk on the beach as the views and turquoise rock pools that you eventually reach are splendid. Please stay clear of the sensitive calcrete formations and look out for interesting seabirds like the shy oystercatchers and whitebreasted cormorants basking in the sun. Hikers are requested to respect the privacy of the guests staying at the remote Lekkerwater Lodge which is on this route. This is a short hike through coastal thickets with ample time to soak up the last of the scenic landscapes, there are two alternative routes for high and low tide. Hippo Pools offers great swimming before the path leads up to Koppie Alleen where the trail ends.